After a few days of persistent rain, the weekend came with a little sunshine! So my family decided to spend the day downtown at the annual art festival. We strolled through booths of local artwork, listened to live music, and of course, partook of the great food. I naturally gravitated toward the Mediterranean food truck hoping for some grilled meat on a stick. My husband went for the Kofta, and I ended up sharing a gyro sandwich with the girls. It was good, but not exactly what my heart (mouth) desired at the moment. Leaving the art festival, all I could think about is chicken kabobs. And it didn’t take too long for me to make my own and satisfy that nagging craving! 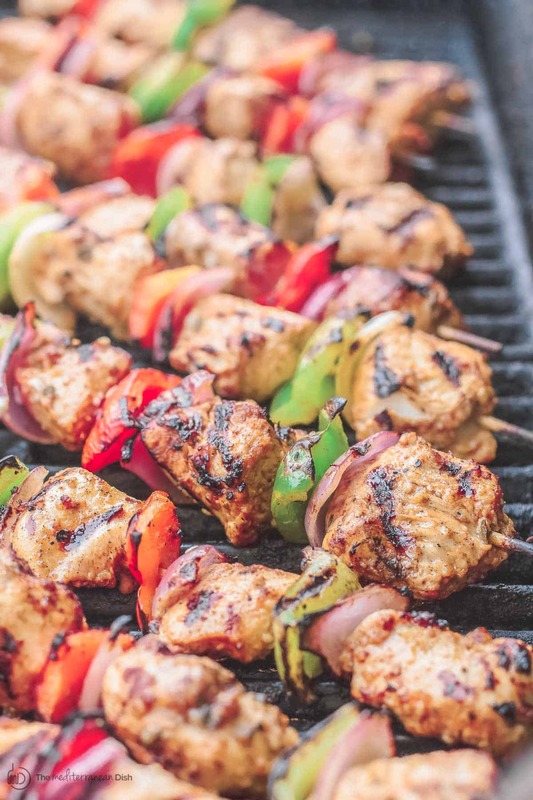 So about these Mediterranean grilled chicken kabobs, they get their round flavor from spices like paprika, thyme, nutmeg and a hint of ground green cardamom. And their intensity and succulence come from a zesty garlic marinade with my favorite extra virgin olive oil. 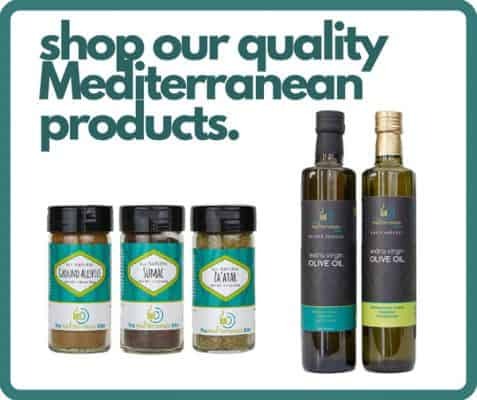 How Mediterranean can you get, right?! 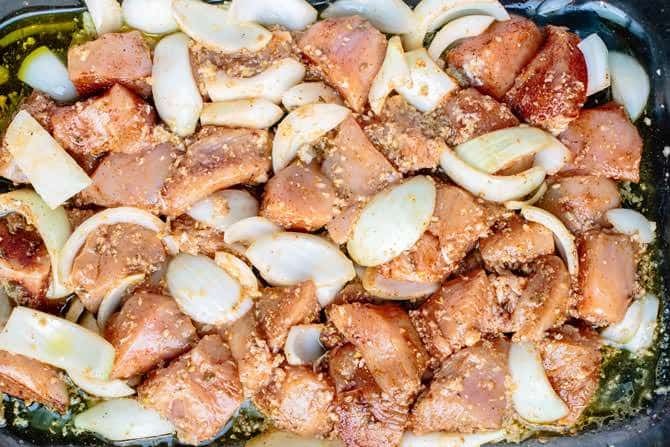 Because there is about 15 garlic cloves and juice of three limes in this marinade, it acts well in infusing flavor and tenderizing the chicken cubes. 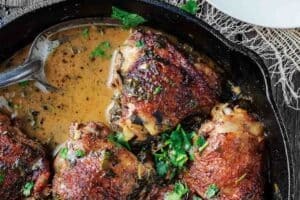 Of course you can feel free to cut back on the garlic, but in my humble opinion, the flavor is just right and is well-balanced once the chicken kabobs are nicely cooked and charred on an outdoor grill. 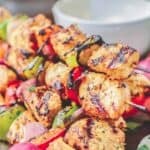 12 minutes on the grill is all it takes to have these chicken kabobs ready for your dinner party! 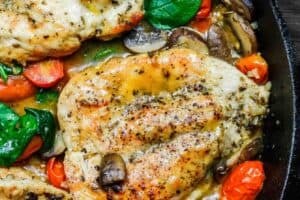 What to serve with these chicken kabobs? Try serving these chicken kabobs next to this easy Mediterranean Mezze Platter I shared last week! And add this refreshing mint lemonade; perfect for a laid-back party. 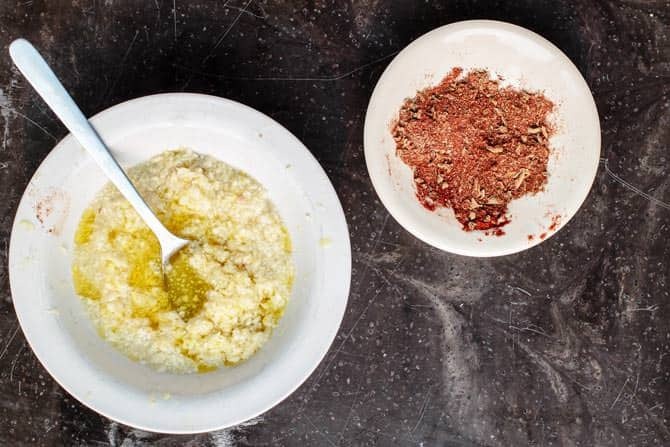 In a small bowl, combine the paprika, thyme, nutmeg, cardamom, salt and pepper to make a spice mix. 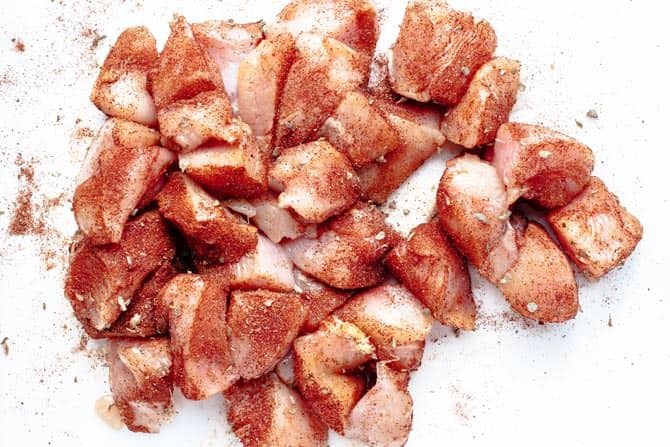 Generously coat the chicken cubes with the spice mix. Place the chicken cubes in a deep dish with the sliced yellow onions and olive oil. 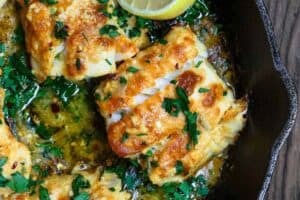 Combine the minced garlic and lemon juice and add them to the chicken dish. Toss the chicken making sure it is well coated. Cover and refrigerate for 2-4 hours or overnight. 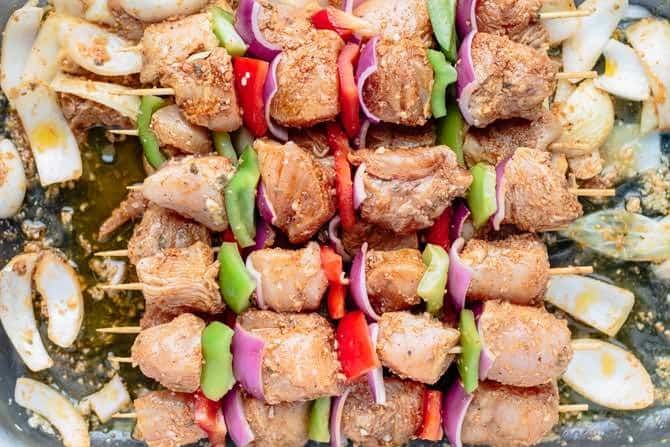 A few minutes before grilling, thread the chicken cubes, green peppers, red peppers and red onion onto wood skewers (skewers must be pre-soaked in water for at least 1 hour before using). Lightly oil and heat a gas grill on medium, covered. When ready, grill the chicken kabobs on medium heat, turning occasionally, for 12-15 minutes, or until the chicken juices run dry. 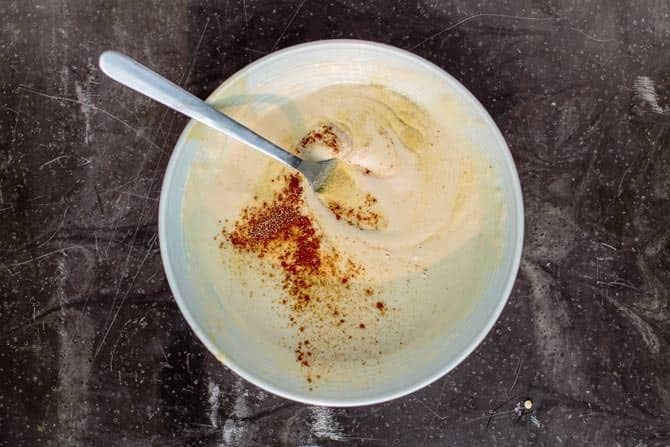 To make the cayenne tahini sauce, whisk the tahini and water together in a bowl until smoother. Add the vinegar and continue to whisk, and if needed add more water. Finally season with the garlic powder, cayanne, salt and pepper. Whisk again to combine. 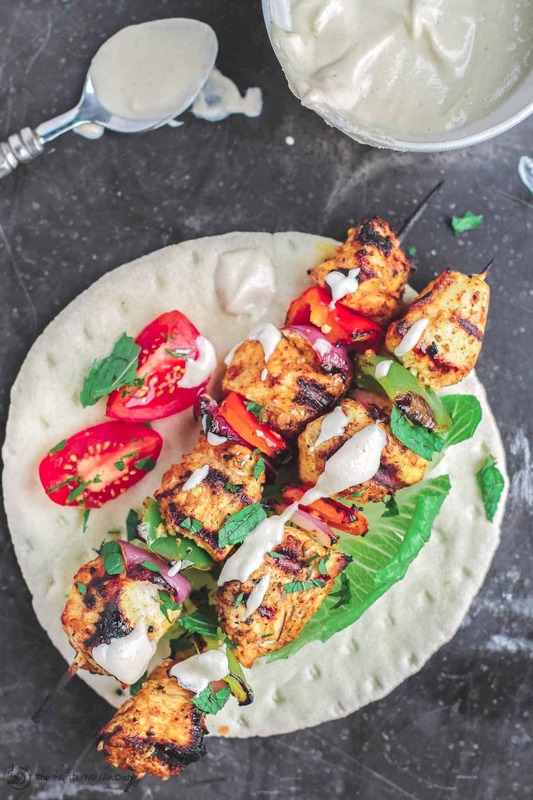 Serve the chicken kabobs with a side of the cayenne tahini sauce, fattoush salad and pita bread. Enjoy! 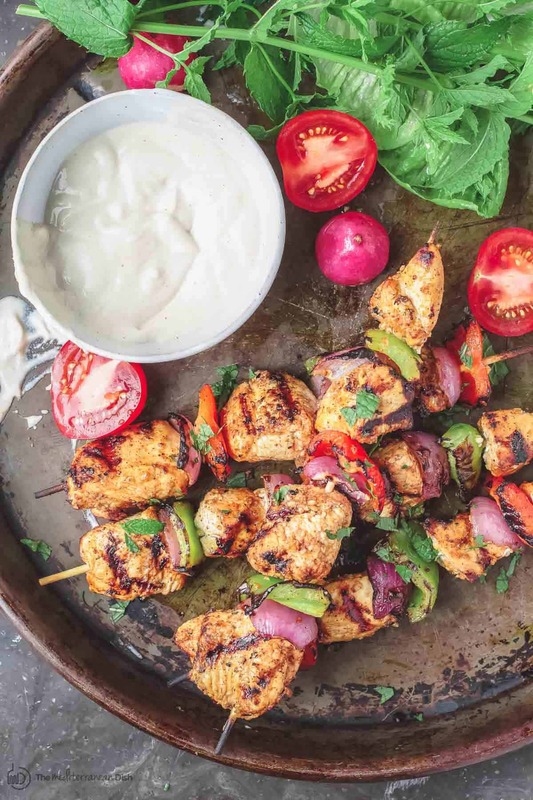 Easy Mediterranean grilled chicken kabobs, served on a skewer with spicy tahini sauce to dip! Lightly oil and heat a gas grill on medium, covered. When ready, grill the chicken kobabs on medium heat, turning occasionally, for 12-15 minutes, or until the chicken juices run dry. 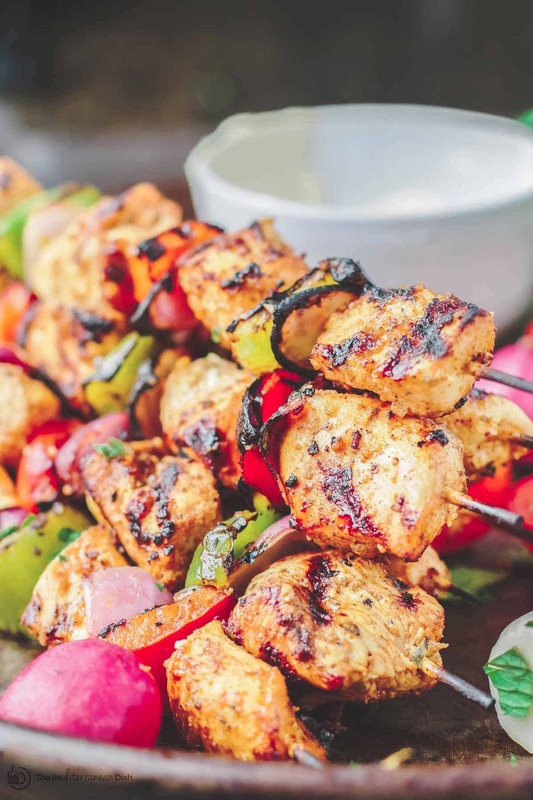 Serve the chicken kabobs with a side of the cayenne tahini sauce,fattoush salad and pita bread. Or, add this easy Mediterranean mezze party platter to complete the meal! Recommended for this Recipe our Private Reserve Extra Virgin Olive Oil (from organically grown and processed Koroneiki olives!). Our all-natural nutmeg, cardamom, allspice, and paprika. What kind of paprika have you used? Regular paprika or smoked? 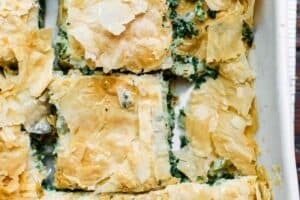 Is the tahnini a paste that I mix with water ? THE ingredient lists lime juice. But the directions say lemon juice which is it? 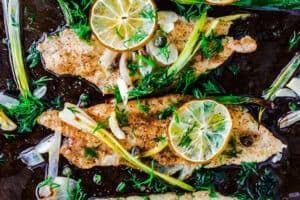 Made this recipe for 4th of July and it was a huge hit! Not a fan of coriander so left it out the second time I made it. I also left the beasts whole abd grilled the on our Big Green Egg and served them on top of hummus withe the grilled veggies on the side. This was a great hit. Awesome, Joey! Thanks so much for sharing!